Daniel joins the MG Residential Team as a Buyer Specialist who serves his clients with diligence, passion, and creativity to provide win-win results. His experience from working in sales, marketing, and business development has given him the ability to clearly communicate the home-buying process with his clients. A proud Bison, Daniel holds a Bachelor’s degree from Howard University in Business Administration with a concentration in International Business and Entrepreneurship. 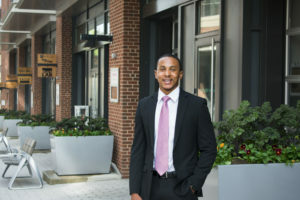 One of his goals is to help organize a Howard University Real Estate Club to connect students to all aspects of the real estate industry through property tours, speaking events, and workshops. When he is not assisting buyers, you may find Daniel at Langdon Elementary School volunteering as a Scoutmaster with the local cub scout troop. An Eagle Scout himself, Daniel seeks to provide his cub scouts with exciting and meaningful activities that help encourage leadership and character development. Daniel can be found buried in a book or checking out new music when he’s all caught up on his favorite Netflix series. Also an avid bike rider, you can catch Daniel riding around the Bloomingdale neighborhood of Washington D.C. where he resides.